Last weekend I finally made it out on my flight around Ottawa which was my 30th birthdya present from Shannon last year. 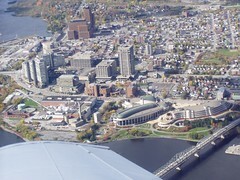 The plane was small but our pilot, Adam, provided great views of the Gatineau hills and downtown Ottawa. We even flew over where our new house is being built and on the way back I got to fly for a little bit. Overall it was very exciting but I did get a little queezy by the end as their was some turbulance during the flight. Posted by Anthony at 10/21/2006 01:02:00 p.m.